That’s that then. 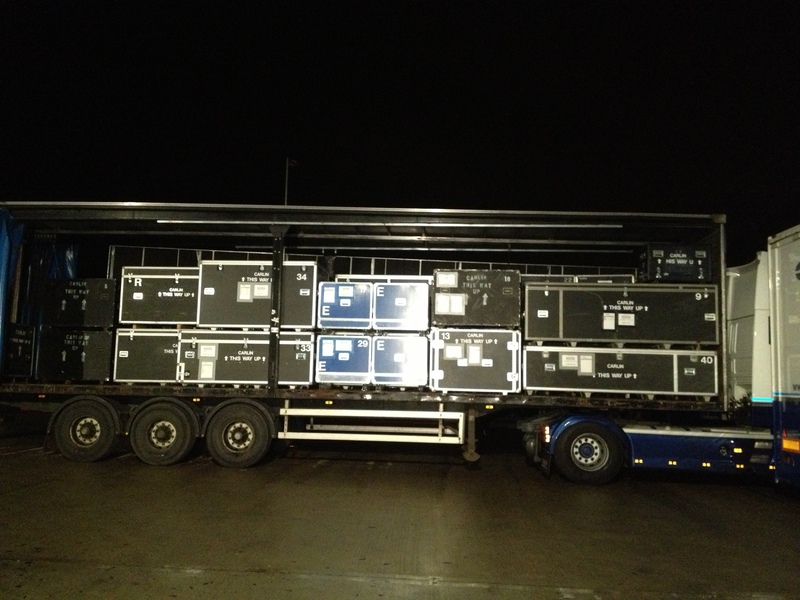 The freight has been packed, loaded, logged and is now making the long journey to Macau where it will wait for us when we arrive next week for the prestigious Macau Grand Prix. 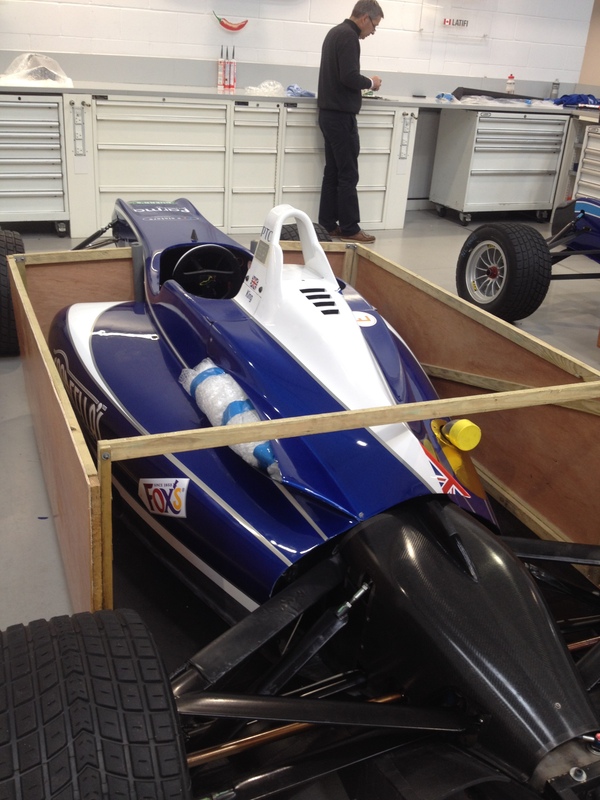 It all started just over a week ago when the Formula Three team got back from Snetterton and Silverstone and began the big job of loading the boxes with everything they will need while they are halfway around the world – including a whopping six Formula Three cars and everything you could possibly think of that goes along with it. First up the mechanics begin the work on their cars. 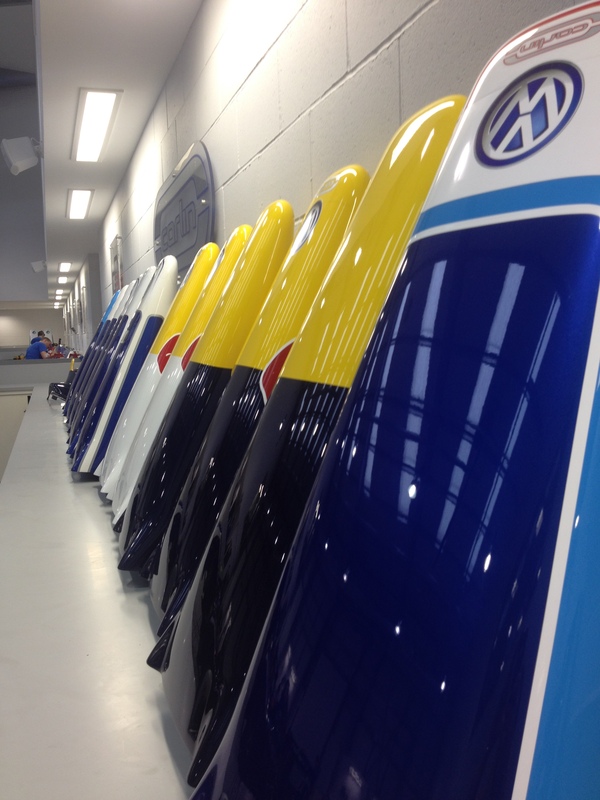 New liveries are designed and applied and the cars are checked over, set up and made race ready back at base. 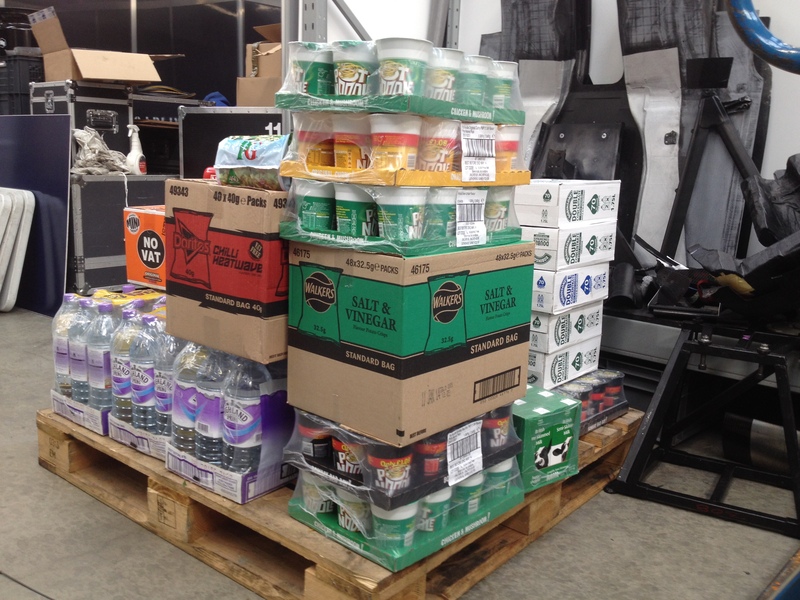 At the same time the first batch of boxes need to be packed – and in these go items such as cleaning products and liquids used inside the cars. These obviously all need to be categorised and are sent out earlier than the rest of the freight. There are also numerous bottles of fantastic (and very regularly used!) 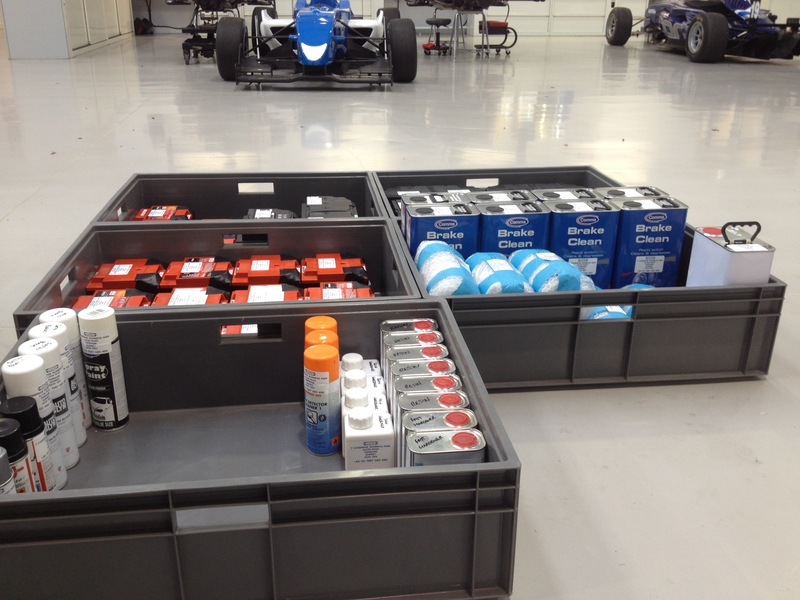 AutoGlym products which we use to clean and look after our cars – ranging from insect remover, to polish to show shine. 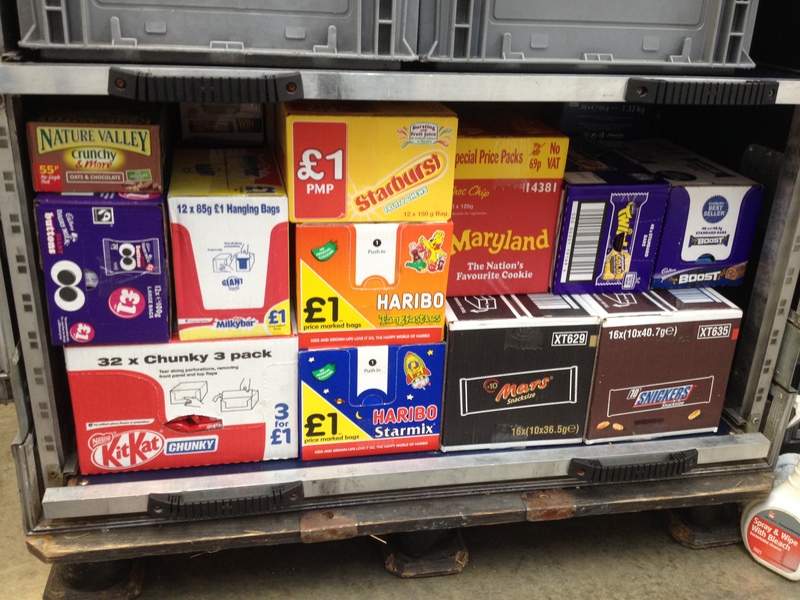 While this is all going on downstairs upstairs there’s a slightly different type of cargo which is being collated; the snacks. You can never tell how long you’re going to be at a circuit so to make sure that everyone gets food if it is a late one, we pack an awful lot of home comforts. As you can see we have the sweets covered. But there are also boxes and boxes of crisps. As well as that quick and easy meal for one… Pot Noodle. On this crate you’ll also find a grand total of 144 litres of bottled water as well as 200 coffee cups and 200 plastic cups. Always nice to be prepared. We also spotted somewhere 14 bottles of cordial. But we couldn’t even begin to tell you which box they were loaded in. 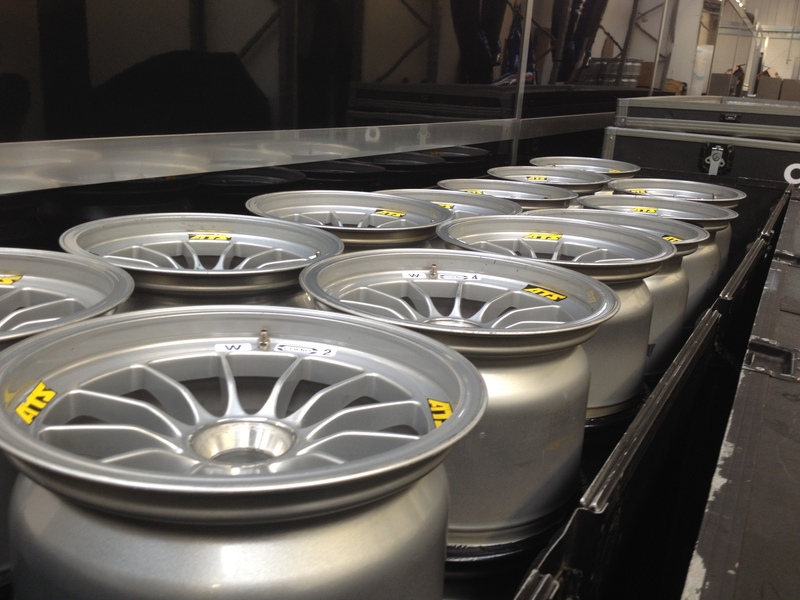 Moving just a couple of freight boxes along to the corridor and you stumble across a grand total of 67 front wheel rims and 67 rear wheel rims all neatly packed away. And what of the cars? While all of the above has been painstakingly packed in to every spare inch of space available, the mechanics and engineers have been working to get the cars ready. But the cars can’t just roll on to a truck like they would do each race. 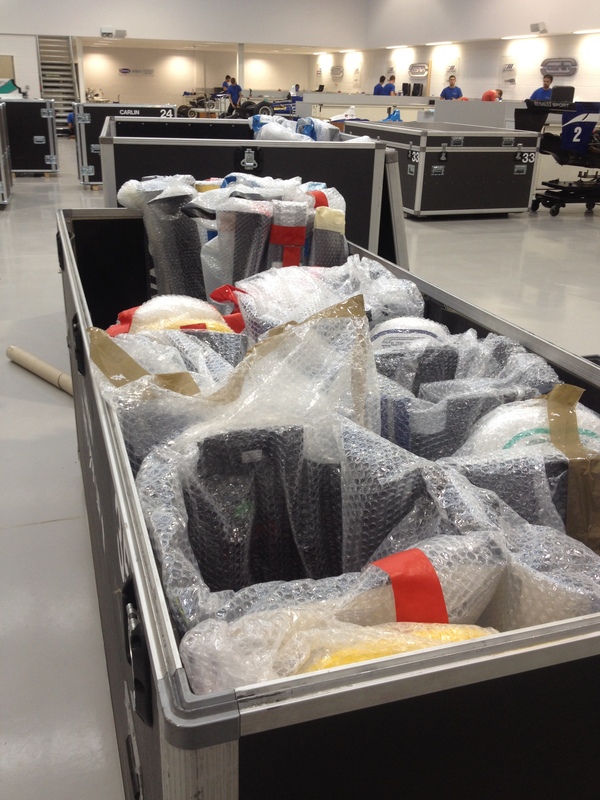 The cars, are taken apart, with a lot of the body work comes off and parts are safely wrapped and labelled. Up next it’s time for the cars themselves. 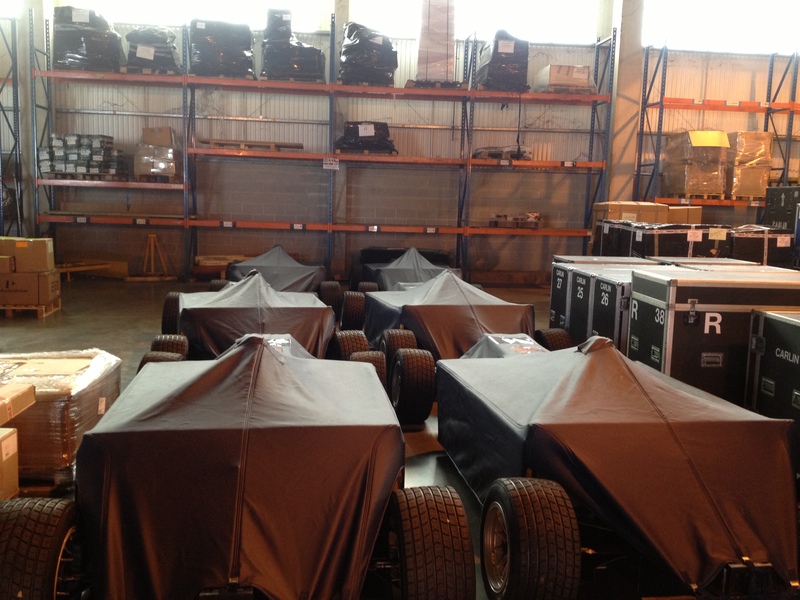 To make sure that they are protected on their long journey the cars are literally boxed up. This then gives them a frame work for their ‘coats’ to go over before they are loaded into a truck ready to make their way to the airport. Meanwhile, the other boxes which will be carrying spares, tools, tables, chairs, radios and of course a hoover were already packed and loaded on to a separate lorry. Everything then took to the road for the short journey to Heathrow airport where they patiently awaited the flight to Hong Kong. We’ll meet up with everything next week when we also make our way to Macau for our final race event of the season.